Gruiformes is the taxonomic order that includes the cranes, rails, and bustards. The order is split into two sub orders, Grui and Ralli. The rest of the families are undesignated in classification. These are the families that have the least in common with cranes. The majority of the species in the order are actaully extinct or have little in common with cranes. While gruiformes means "crane-like", few of the species have much in common with each other. The best known representatives are cranes, which are known for their courtship dances. Gruiformes were created by God on Day 5 of Creation. A crane with its long neck folded in an s-shape. Order Gruiformes is one of the most varied order in all of the animal kingdom. There are multiple suborders and many families, yet few of them have common characteristics. Some are adapted for life in water while others for land. Some are able to fly, while others are flightless. For the sake of simplicity, only the three most common types of Gruiformes will receive anatomical descriptions. Cranes are members of the family Gruidae. They have a familiar anatomical structure with long necks, legs, and bills. Their long legs and necks allow them to live in marsh or wetland environments. The Sarus crane is actually the tallest of all flying birds. Their bills are made in a way that allows them to sift through mud to find small animals. Cranes are known for their longevity of life. In captivity, most will live to be almost 80 years old. Wild cranes live an average life of 20 years. Bustards are members of the family Otididae. They are some of the heaviest flying birds. The Great bustard has been known to reach weights of forty pounds. While some do fly, most are terrestrial. They have longer legs and an elongated body more ideal for running than flying. They don't have the hind toe that most other birds have, preventing them from perching but allowing for better running. Their head stays erect and causes them to move with a strutting motion. Male cranes perform dances to attract a mate. Gruiformes reproduce sexually and are oviparous (egg-laying). The relationship between two crane parents is monogamous, meaning that they only mate with one other crane and work together to take care of the offspring. Some types of cranes will even mate for life. Cranes choose their mates and strengthen their relationships by engaging in elaborate "dances". During these dances, the cranes may jump around and flap their wings. They may also sing or "trumpet" to each other. The dances performed by cranes have inspired dances in many countries and cultures around the world. Bustards are near the complete opposite of cranes. They will try to mate with as many females as possible and let the female take care of the eggs and nest. Many of the other families in Gruiformes have mating rituals of some form. Rails may ruffle their feathers while uttering some form of call. Others circle their partner until the male chases the female. The chase can end in copulation. There are a total of 12 living families in Gruiformes and 15 extinct. Of the living families, there are about 190 living species. They are widely distributed and can be found on every continent with the exception of Antarctica. The family Rallidae is the only family that can be found on every continent, while the other families are scattered. The majority of the order is carnivorous, but there are some exceptions. Cranes are omnivorous, eating a variety of plant and animal matter. Certain birds, including limpkins, may feed on mollusks or other small insects. While Gruiformes cause negligible harm to humans, they are hunted by man in many parts of the world. 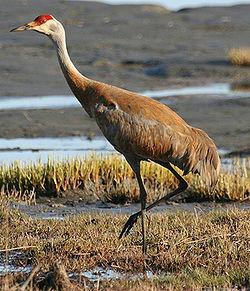 The Sandhill Crane is one of the only species that is known to cause harm. It causes crop damage in Canada's farmlands during migration. Gruiformes have had a influnce on cultures around the world. The most famous influences are the dances of the cranes which have been made in to ceremonial dances by humans. Many African peoples and the Ainu people in Japan have made dances imitiating some species of crane. Cranes are also a symbol of good luck in many cultures. In ancient Greece, cranes were an omen because of the story of Ibycus and the cranes. Buttonquails are a part of a religious ceremony for the aborigines in Australia. Many of the species of birds in gruiformes are kept as pets. The whooping crane has become a symbol of conservation because of massive efforts over the years to save it from extinction. Gruiformes, because of their diversity, have one of the best examples of a fossil record. Fossils of extinct species can be found worldwide. Many of the species were of very tall stature, all the way up to seven feet. Many of these giant birds appear to have been carnivorous predators, from their shard hooked beaks. A Sandhill Crane (Grus canadensis) in Florida. ↑ Gruiformes Author unknown, Encyclopedia of Life, Accessed 1/22/2011. ↑ 2.0 2.1 2.2 Gruiformes Author unknown, Zip Code Zoo, Accessed 1/25/2011. ↑ 3.0 3.1 3.2 3.3 3.4 3.5 Gruiformes (Bird Order) Author unknown, Britannica Online Encyclopedia, Accessed 2/1/2011. ↑ 4.0 4.1 The Cranes Author unknown, The Earthlife Web, Accessed 2/2/2011. ↑ 5.0 5.1 5.2 5.3 5.4 5.5 Gruiformes Author unknown, JRank, Accessed 2/3/2011. ↑ Rallidae Author unknown, Wikipedia, Accessed 2/2/2011. ↑ Rallidae -Rails, Crakes, Coots Author unknown, Animal Facts, Accessed 2/15/2011. ↑ Bustards Author unknown, Britannica Online Encyclopedia, Accessed 2/3/2011. ↑ Gruiformes Author unknown, The Earthlife Web, Accessed 2/2/2011. This page was last modified on 8 January 2016, at 15:23.